Explore the fantastic layouts and hallowed halls of history's greatest tributes to creativity. Much more than simply elaborate architecture, these palaces have their roots in esoteric symbology that was meant to connect one's psyche to this world and the universe beyond. Includes a 20-page monograph with a DIY pop-up model of St Teresa's 16th-century Interior Castle, complete with instructions. All are exquisitely rendered on vellum, and come nestled in a handsome leatherette binder. Have you ever dreamt of that perfect place to live? A setting that would reflect your character and connect you to the world around you, while embracing a need to explore something greater? You're not alone. Here, we uncover some of history's greatest visionary architecture, created to unite us with the ethereal beyond. Stepping beyond architecture's practical uses, we come to a place in our imaginations where buildings act as an intermediary between the structure of our bodies, nature, and the symbolic essence of the universe. Within this dimension, Dream Palaces reveal our eternal desires to connect with something greater. Dream Palaces have played an important role in both the East and the West. They reflect a universal need for metaphors that make sense of our place in the greater scheme of things. Some are romantic, some religious, some practical, some fantastical–others are scientific, or even satirical. So we'll explore a range of Dream Palaces to discover their hidden mysteries and the collective connections between them. 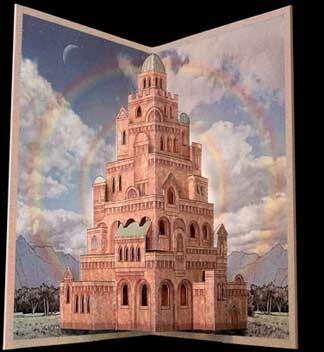 Many Dream Palaces owe their structure to esoteric philosophies or ancient sacred geometry. Their architecture is not meant for luxury, but to elucidate a spiritual path—to create a tangible link between our world and the heavens above. They allow us to embrace a dramatic journey, traveling through their twists and turns to better ourselves. Whether real or imagined, all the Dream Palaces in this folio have been exquisitely realized—many in forms never imagined before. 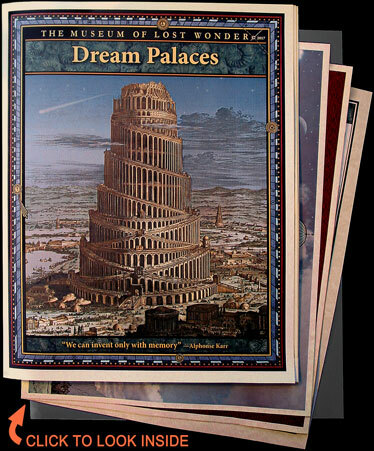 They're sure to be an inspiration for your own palace of dreams.